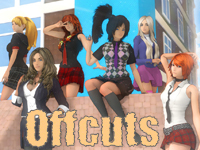 Offcuts is an adult visual novel about a young man returning to his home town after living elsewhere for a few years. While adapting to his new life he encounters both new people and old acquaintances he previously had to leave behind. And well… Some people you just can’t get rid off no matter what happens - you can only hope that they follow you out of affection and not because they want to break your legs. How the story progresses and ends will be up to you, the player. Cole, the protagonist of the game. Somewhat reserved but generally polite and optimistic young man who is moving back to his home town. Handling changes in life, school and other people can be challenging to anyone - guiding him will be up to you. Nina, an old (and most of the time, good) friend of the protagonist. Cole has been living with Nina's family after he had to leave his hometown a few years ago after an incident. She knows everything better than you and is not afraid to say it, especially if it is about Cole. Don’t ruffle her hair, it's messy enough already. Amy, the girl who used to live next door to the protagonist. Bright, friendly and equipped with a sharp intuition. She could sell you anything (but won’t, unless she thinks you need it). Melissa, the vice-president and the unofficial ruler of the school’s student council. Smart, rich and dangerous – at least according to school rumors. Avoid in all situations, or at least keep every exit in sight when talking to her. Alice, a new transfer student just like the protagonist. Shy and introverted, but can be lured in and trapped with sandwiches and headpats. Helen, the aunt and current legal guardian of Alice. She is a busy businesswoman and the right person to talk to if you want to build a skyscraper or two. James, Melissa’s personal driver and bodyguard. A depressing man to spend too much time with and also a person you suspect is keeping something more than just a spare tire in the trunk of his car. Still, not a bad guy to have a few drinks with if you can stomach his unhinged war stories. If you will be shown an error message, click Ignore.